Zion Williamson (1) goes up for a smashing dunk during the NCAA men’s basketball tournament, where Duke University lost in the Elite Eight (Photograph courtesy of Streeter Lecka/Getty Images/TNS). 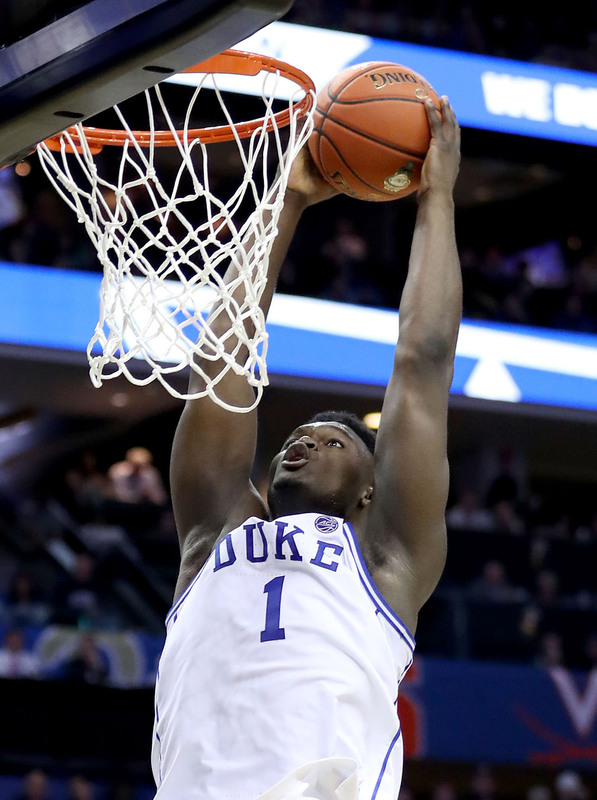 Although he didn’t win the National Championship, the first thing that comes to mind about the 2019 NCAA March Madness tournament is Duke University superstar Zion Williamson. The Associated Press Player of the Year put on a dominant display in the five tournament games that he participated in, only for it all to end after Duke fell to Michigan State University in the Elite Eight by a score of 68-67. In those five games, Williamson averaged 25 points and eight assists per game, in addition to at least five highlight plays. Williamson showed that he is for real, whether it was by catching what looked like impossible lob passes and finishing with huge jams, throwing dime passes, coming out of nowhere and performing a huge block or hitting a contested three in his defenders face. While Fall had his moments against Williamson and was able to make his presence felt, it was Williamson who had the last laugh. Duke, the number-one seed, was down by three against the ranked No. 9 UCF with 15 seconds left with the ball in Williamson’s hands. Instead of going for a three, Williamson put his head down and went straight at Fall, who was waiting for him under the basket. Williamson ended up getting fouled and converting the free throw for an and- one. Duke found themselves in a similar situation two weeks later at the Elite Eight. The difference between those two games was simple. The ball wasn’t in Williamson’s hands in the final seconds against Michigan State with Duke down two. Instead, the ball was given to R.J. Barrett who ended up missing the free throw to tie the game, ending the Blue Devils’ Season. Regardless of how the season ended for Duke, it doesn’t take away the greatness of Zion Williamson. Given his outstanding performance in March Madness, Williamson is the overwhelming favorite to be the Number One pick in the 2019 NBA Draft.